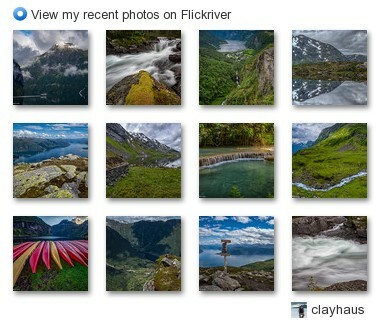 Working with light is the easy truism of what photographers do: no photons, no image burned on sensor, plate or film. But really it is what the light reveals — and in some cases does not reveal — that provides us the canvas to paint upon. In the natural as well as the built world I am continually searching for the lines, angles and patterns that light and shadow create. 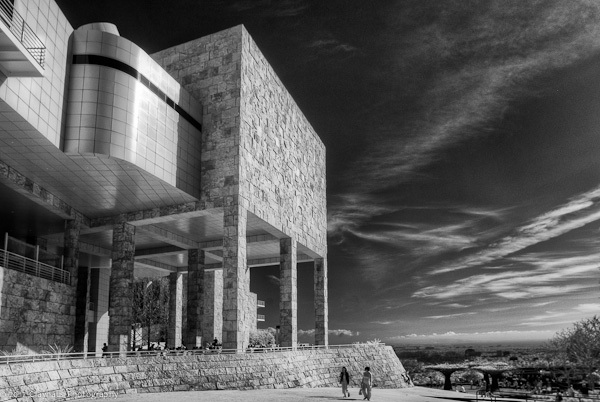 A wonderful place to explore this is The Getty Center, above Los Angeles. 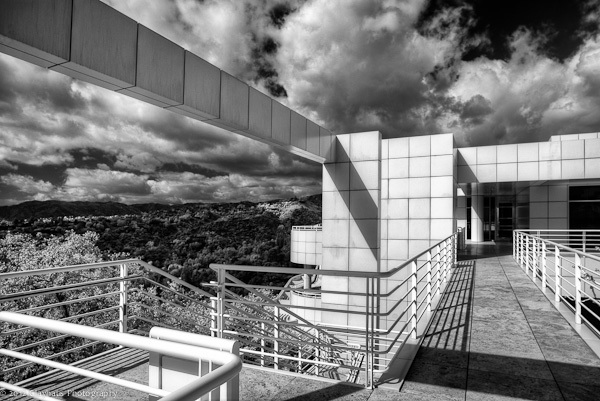 On a recent photography assignment in the L.A. area I had the luxury of a day off and I spent it at the Getty. The crowds were minimal and the weather promised an early Spring. The view stretched to the coast unhindered by the usual horizontal brown streaks, and a deep blue sky with voluminous billowy clouds floated overhead. The shadows were strong without the light being overly harsh. 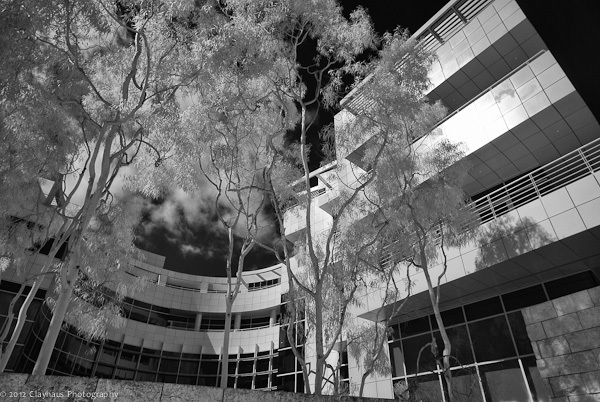 It seemed the perfect set of conditions to forego my visible light cameras and walk instead in the world of infrared photography. Shooting with my infrared-converted Pentax K100 (830nm) and Pentax K10 (780nm) DSLRs at focal lengths ranging from 14mm to 70mm I was able to capture striking compositions. The bright-white clouds contrasted with the deep black sky and both provided the perfect backdrop for the play of light and shadow in the near distance. 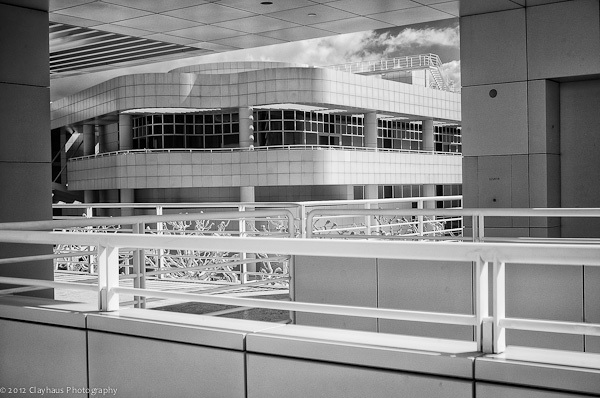 The Getty Center, designed by architect Richard Meier, features his trademark white architecture, in this case white panels overlaid on curving, even sensuous framework. This is juxtapositioned with arrow-straight beams and walkways. Superimposed on all are multiple impressions of grids: in the walls, the windows, the stairwells, and railings. Occasional walls and foundations of rough-hewn, pale ochre stone act as a marked and organic contrast to the mathematical equation of the main metal and concrete structures. The fun begins immediately after stepping off of the tram in the Arrival Plaza (you must take a small ‘people-mover’ from the lower parking lot to the Getty complex, per se). Most people quickly shoot their first of many tourist photos here standing in the front of the wide ascending steps leading to the Museum Entrance Hall. This building yields the classic undulating pose featured in brochures, articles, and so many folks’ photographs...including my own. But having shot it from ground level a few years back, I wanted a different view. That’s what led me to climb the steps leading to the upper floor of the oft-ignored restaurant building. This put me at a level to shoot the curves of the main building straight-on, but more importantly gave me lots of lines, curves, patterns, light and shadows to play with as I worked my way around the structure. From there my wanderings took me to the Research Institute Exhibition Gallery, the gardens (too crowded), the West Pavilion and back to the Museum Hall. 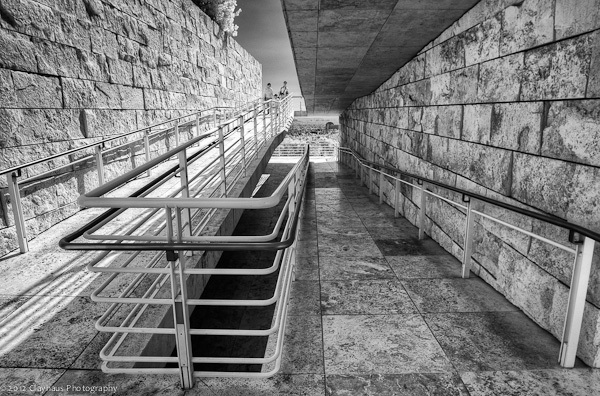 When my day at the Getty was finished I had not even ventured into the Main Plaza, much less the North, South and East Pavilion buildings. No worries: something left for my return visit. 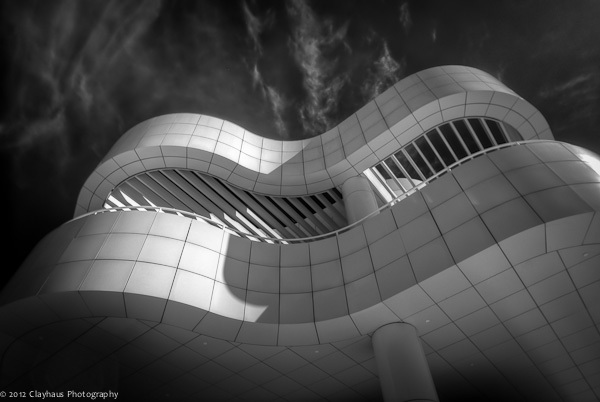 Exploring the lines, angles, patterns, light and shadow of architecture is not only a joy but can yield rich and compelling images, especially if you take the time to really work it.